This week, several newspapers went big on a rise in the police recorded crime figures: prompted by a press release by that doyenne of numerical literacy Diane Abbott. As an economist, I am something of a professional numbers geek. I nerd out over statistics and quibble over methodology. And the thing about the ‘police recorded crime’ (PRC) figures is they don’t actually reflect the level of crime. At all. But don’t take my word for it. Take the word of the UK Statistics Authority – the independent body that regulates government statistics – which has warned extensively that PRC is a meaningless statistic. In January 2014, it removed the status of National Statistic from the figures – essentially making them unofficial. Indeed, the UK Statistics Authority has had to warn Labour before to stop using it as evidence that crime was rising. Presumably, Labour will be receiving a similar letter again now, because it is a flagrant lie to say that it is. Instead, the ONS uses the Crime Survey for England & Wales as the definitive measure of the level of crime. And lo and behold, the Crime Survey shows crime down 7% in the last year and 35% in the last five years. 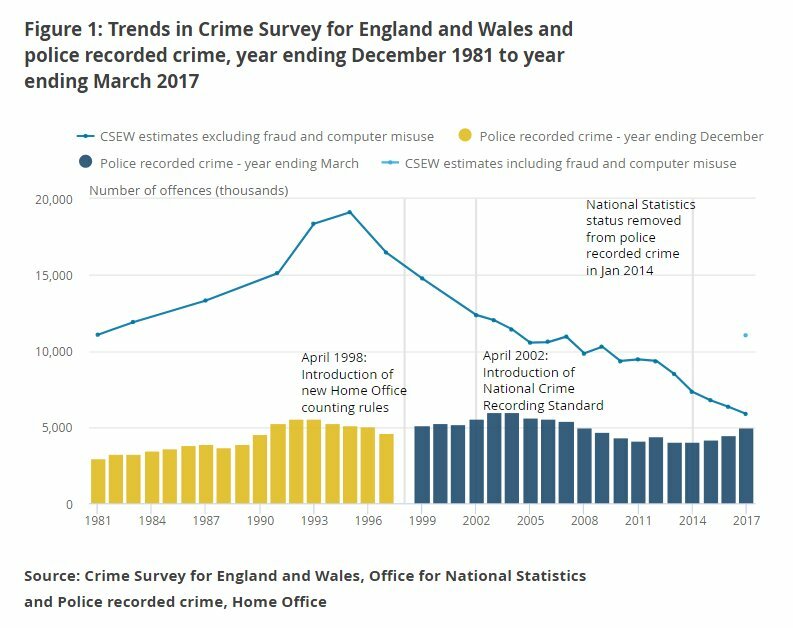 The chart below is from ONS and the blue line shows the precipitous fall in crime. So what’s the difference? The PRC figures are literally the number of incidents that are reported to police forces by members of the public and then recorded by the police. They are therefore a reflection of a lot of things: confidence in reporting to the police, how responsive the police are to reports, and the legal definitions of offences. It’s surely a good thing if people are more confident in the police, if the police record the complaint properly, or if offences are well-defined – all of which would cause PRC to go up. The Crime Survey, by contrast, involves a market research company asking tens of thousands of people every three months whether they’ve been victims of crime and to describe the offence. This is infinitely superior for a number of reasons. First, it captures occasions where people didn’t bother reporting the offence or where the police didn’t record it properly. Second, it excludes victimless crimes (which is good – why count a victimless crime as the same as a violent offence?). And third, it uses a standardised methodology across the whole country and between years, and therefore makes year-to-year comparisons statistically valid (PRC does not do this). So that’s why the Office for National Statistics and the UK Statistics Authority that oversees it use the Crime Survey, and why you should too. Labour, on the other hand, have used the PRC statistic, despite having been officially warned not to before. Why? It’s hard to see any reason other than them being pathological liars that will say anything to win votes. But what’s new?